For more information about this procedure, please refer to this page: Single Anastomosis Duodenal Switch. This is the case of a 45 year old male who has been suffering from morbid obesity, type 2 diabetes for 15 years, under insulino therapy, with high blood pressure, and dyslipidemia. Three years ago he had a laparoscopic sleeve gastrectomy in another country. His initial weight was 155 kg, and his height is 1.75 m. He lost 30 kg in the first year after the procedure, and regained back 20 kg the following two years. During all this period his diabetes was unbalanced even with the insulinotherapie. The patient was referred to Dr. Nagi Safa by his endocrinologist to perform a revisional bariatric surgery, in order to treat his morbid obesity, his type 2 diabetes and the other co-morbidities. During the preoperative evaluation and preparation we performed an OGD and an abdominal CT scanner. Besides of having an enlarged remnant stomach, no other abnormalities have been detected or noticed. Dr. Nagi Safa decided to perform a single-anastomosis duodeno-ileal bypass with sleeve gastrectomy. At the beginning of the procedure Dr. Nagi Safa started by exploring the abdominal cavity. No major abnormalities have been noted. Due to his previous sleeve, there are many adhesions between the stomach and the pancreas, and the retroperitoneum. With a 5 mm ligasure, Dr. Nagi Safa proceeded to meticulous dissection of the adhesions, liberating the upper part of the stomach including the fundus. After that Dr. Nagi Safa started the dissection of the antrun. It was adherent to the transverse meso-colum. Following this, Dr. NagiSafa started the dissection of the duodenal specially the posterior part. We pursued this dissection until we arrived to the pancreatico duodenal pedicle. At this point, Dr. Nagi Safa started doing the retro duodenal passage using a maryland grasper. 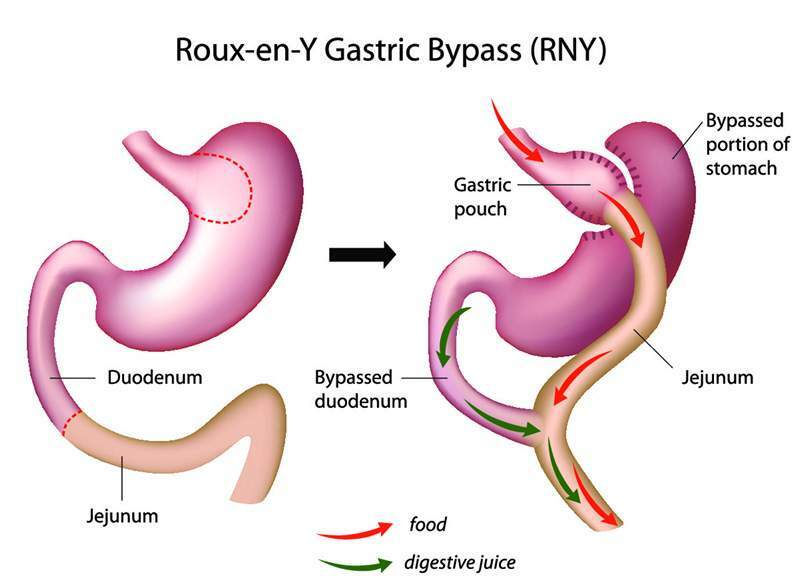 This procedure was done without any bleeding, and without affecting the pancreas. After this, Dr. Nagi Safa started performing the Sleeve gastrectomy using green endo-gia straight. 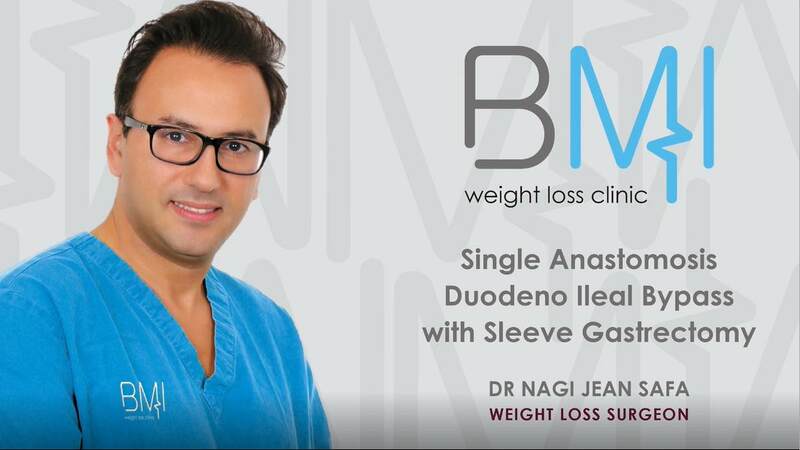 The sleeve that has been performed three years ago was enlarged, Dr. Nagi Safa is using a 40 french bougie to calibrate the sleeve. In the duodenal switch, it’s important not to tighten the entrum. Dr. Nagi Safa needs to minimize the probability of vomiting because of the important malabsorption that we are creating. Following this, we used a 60 mm blue cartridge endo-GIA to section the duodenal 2 cm after the pylorus. During this manoeuvre we were very careful not to hurt the pancreas. Finally we localized the ileocecal junction, and we started measuring with the help of the graspers the distance of 2.5 meters from this junction on the ileum. This will be the exact place where we will perform the duodeno ileal anastomosis. Using barbed sutures, we started by fixing the ileum on the duodenal. This is the first posterior layer of the anastomosis. With the bovi, we make a 2 cm opening on the duodenal, followed by a 2cm opening on the ileum. At this point, we perform the second posterior layer, and we proceed directly to the closure of the anterior layer of the anastomosis. As you can see, during the procedure, the bleeding was minimal. The patient has well tolerated the surgery. No complications were noted in the following days. The patient was discharged two days later.